One of the most spectacular sites is the Dragon’s Tomb where many skeletons of the hadrosaur Saurolophus angustirostris were collected by the Russians in the late 1940s. The skeletons are articulated and many feature beautiful skin impressions. 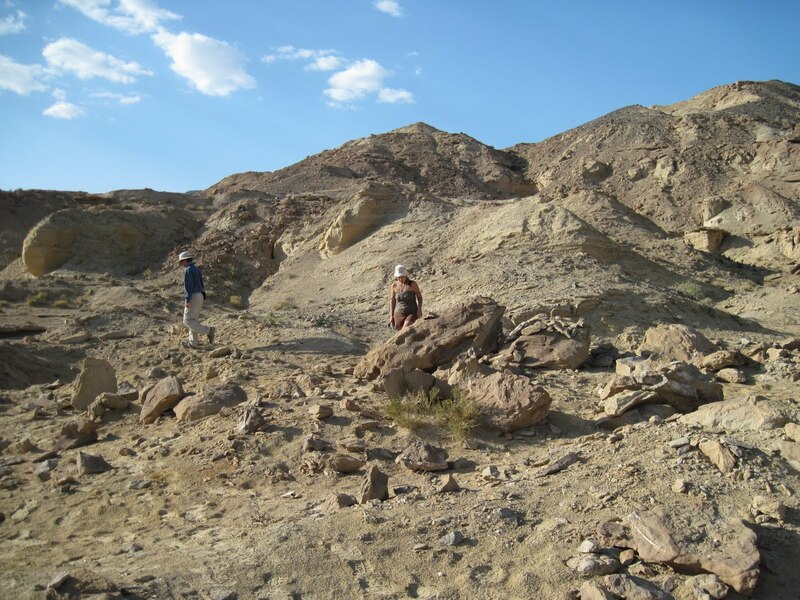 Unfortunately, the bonebed has been heavily poached – fossil poachers in the Gobi collect teeth and claws, but typically destroy whole skeletons in the process. Teeth and claws are the easiest items to sell. It is illegal to export dinosaur fossils for sale from Mongolia, but they seem to keep turning up on eBay and at rock and mineral shows around the world. Our team did not collect anything here (as this site is being worked on by David Evans, Michael Ryan, and the crew of Nomadic Expeditions – see their take on the site here), but it was great to visit such an amazing locality. 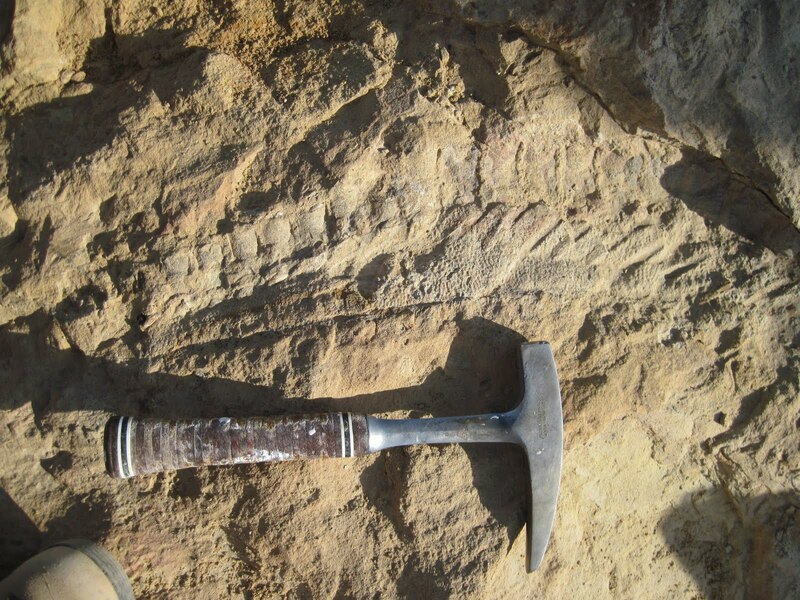 Here’s a nice example of skin impressions at the Dragon’s Tomb. 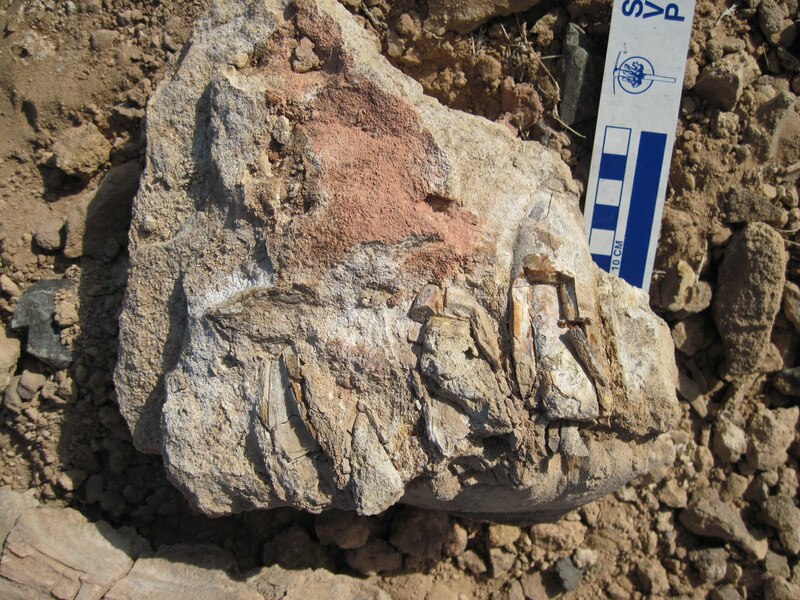 During our time at Altan Ula we found a pretty cool Tarbosaurus specimen that actually had non-poached teeth! Unfortunately, the specimen was too heavily weathered to collect, with the teeth just being way too fragile. Tarbosaurus is the Mongolian cousin of the North American Tyrannosaurus. They’re about the same size, but Tarbosaurus has proportionately smaller arms – and Tyrannosaurus arms are pretty small! ← Adding to the long list of dragons.